Color has a way of subliminally influencing behavior and the perception of objects and products. We are all affected by color which is based on our intangible psychological perception. This stems all the way back to nature and our natural instincts to either fight or flight. This natural instinct takes its cue from color in many cases. How our reactions or actions are altered based on how we visualize a certain color, directly affects decisions. For example: Bright, intense colors tend to stir higher alerts in us, while softer or lighter colors convey peaceful emotions. So color brings in a critical element to our ability to survive, but color in small business marketing and sales strategy can also be applied to great effect. Research has shown that not only do certain colors influence specific actions, but specific shades of that same color can shift those actions in subtle directions. Knowing that color not only shifts our behavior is important but also recognizing that it it shifts various personalities slightly differently is equally important. In one report, it hones in on that fact that each color value will have a reaction inside our brain based on how we internalize each color. Certain personalities will react one way on one color and others will react a different way. 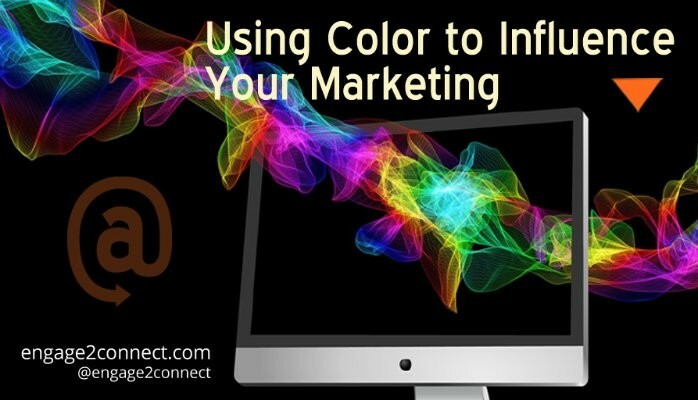 So, it is fair to say that understanding your target audience’s personalities within your business is pretty critical in understanding how to create the correct color influencing behavior in their buying pattern. If we dissect this a bit further, we know that light is simply a broken down spectrum of white light. Each wavelength signifies a different color. So how we visually see these wavelengths factors greatly as well. Print content is made up differently then digital content. Print is created by applying ink in cyan, magenta, yellow and black as small dots to a substrate, while all digital material is made up of light wavelengths of Red, Green and Blue, each added together to produce a wide array of colors. It makes sense then to recognize that each of these medias must be treated slightly different and their influence by color is also slightly different. Running your small business has to discern on color choices whether in the print or digital media and knowing how, where and when they should be used. Both print pieces and digital marketing content must provide the desired action and result with the customer at the end of the day. The suggestion in perception to them must be clear and an understanding on how best to use these are a bridge to building a strong successful small business. The US Small Business Administration reports that 85% of consumers say color is a primary reason for people to buy. Color matters for small business and it matters big! Color is integral in your marketing and probably one of the most significant choices on your marketing decision list. But use it wisely. Depending on what behavior you are looking to influence in the type of business you are running will determine the color choice or color palette you need to be selecting. Studies have found that color influences appetite, mood (energize or calm down), reduce perceived wait time and purchase products. You have about 90 seconds for your customers to make up their minds on whether they are considering purchasing from you or not and color is a big persuader of this selection. Believe it or not up to 90% of purchases are based on color alone in their decision to buy and this data by itself should be powerful enough to establish that color is a decider in purchase power. With color being the core to your purchase power you need to know how, where and when to use it effectively. Here is an overview on the best uses for color in your small business marketing strategy. The Where – Providing color on your website is essential in defining sections, navigational flow and most importantly an action or call-to-action (click or link to a conversion or resource page or even provide more detailed info on a product or service). Deciding on a color that influences that action should contain the notion of disruption in your customers movement. This will then direct them to your conversion page and start bringing them through your sales funnel. When we talk about a disruptive color what we mean is a color that needs to be outside of your brand’s color palette but still designates the right perception to your audience. For example; you may not want to use red as your action color if your business is in relaxation therapy even though it is disruptive to your brand palette. Why? Because of the connotation that the color red brings with it, energetic, alert, electric. This acts in complete opposite to the customer’s perception of that business. Does that make sense? In addition to your digital color palette you also need to consider your in-store signage. These colors should contain a bright attention grabbing color that calls attention to your special or markdown but be cautious of your brand colors here since they may or may not effect your color choice. Too much of one color brings less hierarchy to the action color in your signage, so if your brand palette is primarily red you may opt for a different color choice for the action message. The When – In most cases color is the perfect solution to visual impact but sometimes less is more. For instance if you have content you would like to share on your website you will be better off placing it on a white background in a clean area. Making it easily read and digested by the audience. Placing it on a black background with white type can be very taxing for the viewer to read and in some cases can cause physical issues when attempting to read it. But on the contrary in a print format to run white copy over a dark printed page is less of an issue. The idea again speaks to the light wavelengths for digital color and the dot matrix of ink with print. Each must be handled accordingly taking into consideration the medias issues. In your brand’s logo mark, the use of color increases brand recognition by 80%. Yet in some situations a simple black and white logo mark makes a very strong impact, like Nike’s swoosh and Hootsuite’s rebranded Owly logo. These brand’s opted for black, taking in the fact that their brand mark would be surrounded by a field of colorful product and images and would stand out by not utilizing color. In the situation with Instagram that is still under debate. We find it a concern in taking their well known brand and adding in the rainbowed field behind it. In many people’s minds this move was counterproductive because people felt lost in the change not organically inclusive. Their loyal connection with the original brand mark was jeopardized and this can create confusion. So keep in mind in selecting colors for any of your marketing pieces to create consistency, while still being evergreen in your business lifecycle, especially as it grows. Sure color is subjective, but it is also predictable in many aspects and you need to be aware of these if you want your small business to use color effectively. When you start to put together any small business marketing material for your company make sure you consider a few of these principles, which can prevent mistakes. Using color in your small business marketing will save you time and money on having to redo things and in losing potential new customers in the process. Remember to use color to influence customer empowerment, BUT be strategic when doing it.